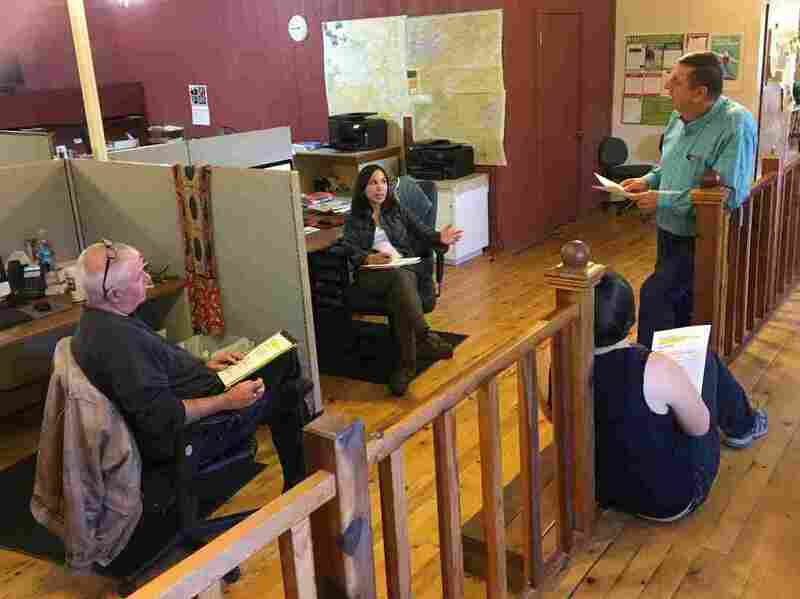 Digging Deep Into Local News, A Small Newspaper In Rural Oregon Is Thriving In far eastern Oregon, a small weekly newspaper is bucking an industry trend. The Malheur Enterprise was languishing, but it has recently won several national awards and circulation is surging. Malheur Enterprise reporters Pat Caldwell (from left) and Kristine de Leon; Les Zaitz, editor and publisher; and, sitting on the floor, reporter Jayme Fraser meet to talk about assignments. The Malheur Enterprise was founded in 1909, and, like many other newspapers, was languishing. But in the past few years, its circulation has surged and it has won several national awards. Perhaps surprisingly, the weekly paper's turnaround and increased popularity happened in a part of the state that strongly supports President Trump, who continues to lash out at the media. The newspaper's recent success has meant an increased workload for the woman who delivers the papers. Wednesdays are delivery day for the Enterprise, which means 74-year-old Sheila Schroder is on the job. Sheila Schroder, 74, loads her pickup truck with the latest edition of the Malheur Enterprise. Schroder travels about 100 miles throughout Malheur County, Ore., to deliver the paper each Wednesday. She has been doing the job for more than 20 years. 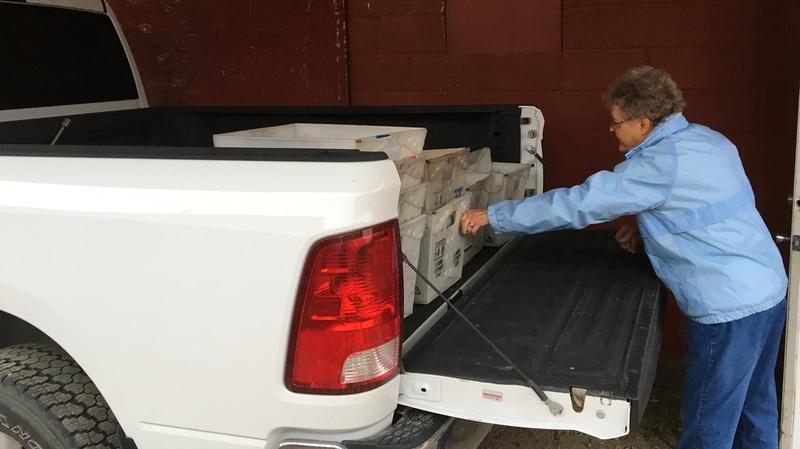 Schroder loads her white Dodge Ram pickup full of papers and rolls onto the streets of Vale. The tiny eastern Oregon town, population 1,900, is where the Enterprise is headquartered. Her stops include the county courthouse, a nursing home, a flower shop. The pickup crammed with papers is an upgrade from when she started doing this more than 20 years ago. "That's when I had a grocery cart and I delivered papers with my grocery cart full of papers," Schroder says. "People called me 'Bag Lady,' " she adds with a laugh. Now, using a grocery cart would be tough. On her Wednesday rounds, Schroder logs about 100 miles, traveling throughout Malheur County, Oregon's second largest. Her expanded delivery zone is one of the effects of a newspaper that has boomed in the past three years. "Boomed" is a relative term when it comes to a rural weekly. Paid subscriptions are at about 2,000. But during a recent week, more than a third of Malheur County's roughly 30,000 residents read the paper's online edition. And advertising dollars, the lifeblood of a small newspaper, are way up. "Our overall revenue is more than triple what it was three years ago," says Les Zaitz, the paper's editor and publisher. "Circulation is probably double. We're profitable, and there are not a lot of papers in the United States that can say they're profitable." Zaitz is largely responsible for this. Although he would rather smack you with his humor than admit he is the reason for the turnaround. "It's a damnable lie," he says, laughing. But really, it's the truth. Zaitz, 63, was a longtime, award-winning investigative reporter for The Oregonian, the state's largest newspaper. He is a two-time Pulitzer Prize finalist. But he has always had a passion for small-town papers. Which is why, in 2015, he tabled his retirement plans and bought the Enterprise with family members. The paper, at the time, was almost out of business. It was filled with gossip and press releases. "It wasn't delivering much in the way of real local news," Zaitz says, adding, "[it] had one reporter who primarily focused on high school sports. And only in Vale for the most part." "It had not had an ad salesperson in 10 years. It took only what business came in the front door," he added. "There was just no doubt in my mind that if we turned around the news product, and got a salesperson in, we could make the thing profitable pretty quick." Sure enough, the Enterprise now is a serious, award-winning newspaper. 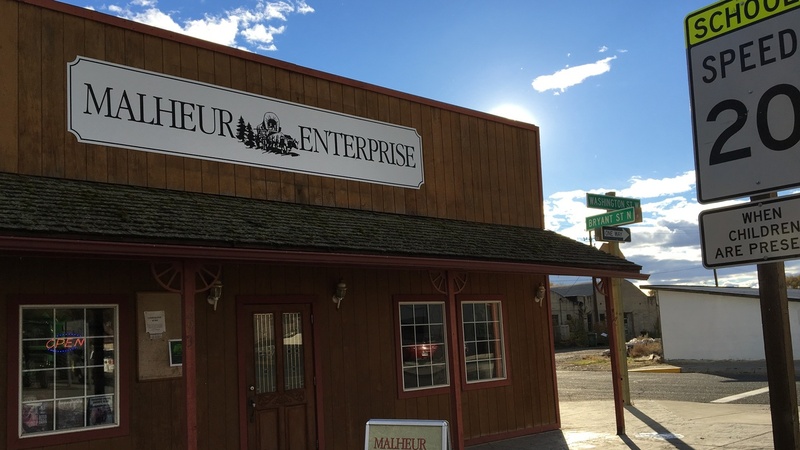 The Malheur Enterprise was founded in 1909. The newspaper has had a renaissance in the past three years since it was bought by longtime newspaper reporter Zaitz and his family. This spring, the paper won a prestigious national Investigative Reporters and Editors award for its coverage of a case that rocked Malheur County. A man released from the state hospital after claiming he faked his mental illness was accused of killing two people after being freed. The Enterprise was the first weekly paper to win the IRE Freedom of Information award. "For a remote rural weekly to achieve that kind of journalistic attention," Zaitz says, "boy, your chest comes out a little farther. There's a little spring in your step the staff is really proud of." The reporting staff has "swelled" to three this year, thanks to another honor for the Enterprise. The investigative news organization ProPublica is paying for a reporter, for a year, to focus solely on the story that earned the IRE award. The Enterprise was one of only seven newsrooms chosen nationwide, out of 239 applicants. "We set the bar, the quality we want from our stories, and we don't publish them until they hit that bar," says Jayme Fraser, the ProPublica-funded reporter. "Unless there's some unusual extenuating circumstance because of time. Whereas at a lot of papers, you don't wait to hit that bar." Fraser and her colleagues work in a wood-paneled newsroom that's small enough to hear your neighbor's phone conversations. And hear, in the questions, the influence of Zaitz. Reporter Pat Caldwell, who has been a journalist for 22 years, says Zaitz has transformed the way he works. "It's all about detail," Caldwell says, "detail, detail, detail. Y'know? And why, why, why, why? Why are you doing this? Why is this happening? Who pays for it?" "That is really sort of the foundation of the Malheur Enterprise these days," says Zaitz, "in-depth aggressive coverage that you normally don't see in rural America." What you do see, a lot, in rural America is support for a president who regularly attacks journalists with pronouncements of "fake news" and the media as "enemy of the people." Donald Trump won nearly 70 percent of Malheur County's votes in the 2016 election. For some in Vale, that support extends to Trump's anti-media message. "I don't watch national news because it's biased, I feel," says Steve Paulsen, 62, an environmental consultant. "I feel like they give their opinion, instead of just the facts," says 83-year-old Bob Bement, a retired schoolteacher and coach who still flies his own plane. Bement's business card says "Time to Spare? Fly Vale Air." 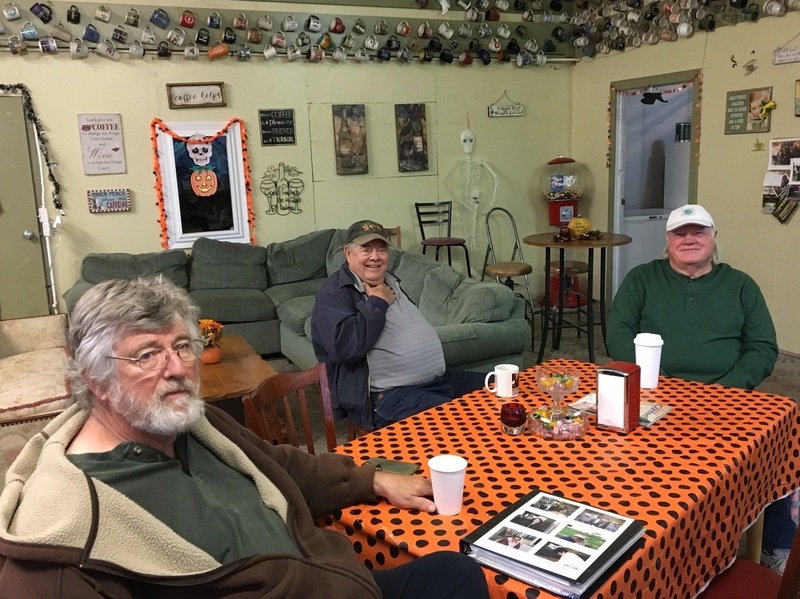 Dennis Hall (from left), Bob Bement and Steve Paulsen get together most mornings at the Lucky Cup in Vale, Ore. They drink coffee, crack jokes and largely steer clear of talk about politics and the media. But they're quick to praise the Malheur Enterprise, the local weekly paper headquartered in Vale. Paulsen and Bement are members of an early-rising group that gets together, most mornings, at the Lucky Cup in Vale. The group is all about coffee and light banter and jokes, which, on the day I visited, took whacks at farmers. "You know what they call 10 farmers in the basement? A whine cellar." "What's the difference between a puppy and a farmer? A puppy grows up and stops whining." Generally there's not a lot of talk about politics or religion or media. But there is quick praise for the Malheur Enterprise. Paulsen and Bement, who distrust the national media, trust the Enterprise. So does local attorney Carol Skerjanec. "We're pretty intelligent people," Skerjanec says, adding, "So we don't need to be told how to feel about something or what direction to take or what stance to take. Just tell us what the facts are and we'll make our own decision. And I think that's what Les is doing." Zaitz is a fierce defender of journalism. 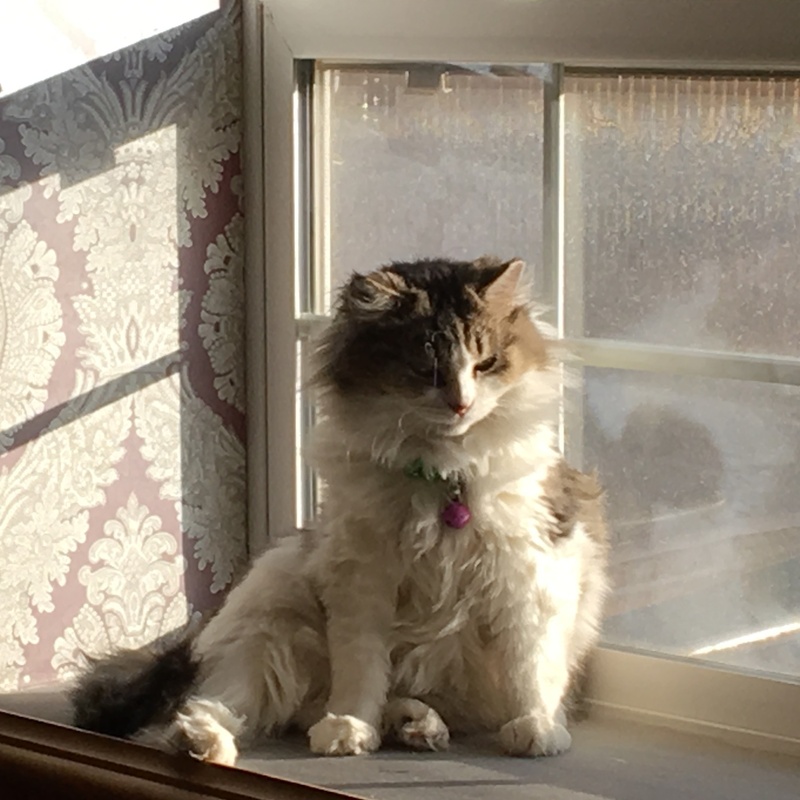 But he can understand the disenchantment with cable news, and even disenchantment with reputable major newspapers like The Washington Post and The New York Times. Zaitz says he has friends at both papers, but he thinks they may go too far in their Trump coverage. Dissecting every early morning tweet by the president, Zaitz says, is like hawks sitting on a fence wire, waiting for the mouse to move. "What that sort of incremental coverage does," Zaitz says, "is it just overwhelms the important reporting. And I think it dulls the American public's appetite for what's happening in Washington." He knows there's an appetite for good reporting. Zaitz has earned his readers' trust with his devotion to bedrock principles of journalism. He acknowledges it also helps that he is one of them. His hands are thick from bucking hay and fixing barbed wire fences on his ranch about 100 miles outside Vale. But being on the inside doesn't mean he and the Enterprise pander. Zaitz has written editorials criticizing U.S. Republican Rep. Greg Walden, who is quite popular in the area. Enterprise reporting has angered local politicians. Some still don't talk to Zaitz or his reporters. "Public officials who've evaded scrutiny for decades here aren't very fond of us in some quarters," Zaitz says. "But the good public officials, those who are trying to do a good job, they recognize that we are doing our job and we are holding them accountable and we're making them better governing officials. And they don't object to that. Because we try to be accurate; we try to be fair. While they may have to salve the sting of a particular story, that sting wears off and they appreciate what we're doing." Dinah is the newsroom cat. A rescue animal, she lives at the newspaper's Vale office. Staff members divvy up the cat care: feeding, water, litter box. "We've had some clashes [with the Enterprise]," says Ontario City Manager Adam Brown. Ontario is Malheur County's largest city. "At the end of the day, though, we respect the business they're in. They're kind of the fourth branch of government," he says. Al Cross, who directs the Institute for Rural Journalism and Community Issues at the University of Kentucky, says Zaitz represents the ideal community journalist: a person "who is in the community, of the community," Cross says, "but isn't afraid to hold up a mirror to the community that may look unflattering." Across the state from Vale, in the western part of Oregon, Zaitz manages a digital news service serving Salem, Oregon's capital city. It's another element, Zaitz says, laughing, of his anti-retirement program. Actually, it is another element of Zaitz's mission to spread top-notch local reporting. "Rather than worrying about what's going on in journalism at the national level," he says, "let's turn the periscope around and let's rebuild from the small guy up. And I think that's going to have more influence in the long run." A previous caption in this story incorrectly gave Sheila Schroder's age as 72. She is 74. Additionally, Carol Skerjanec's last name was misspelled as Skerjanic.